After two losses on the trot, Wests Tigers head coach Michael Maguire has made some changes in the forwards for the round 5 clash with the Broncos in Brisbane this Thursday night. 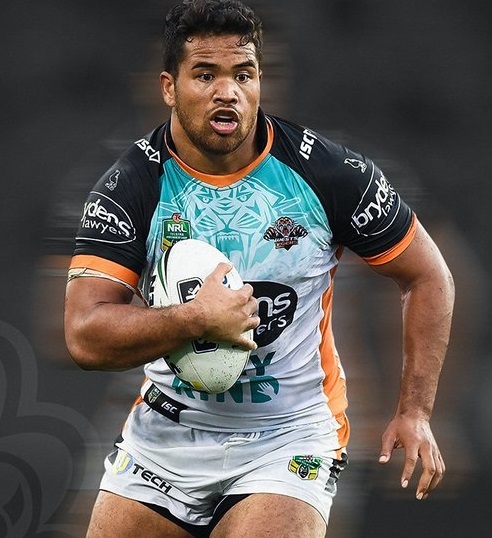 The most notable is lock forward Elijah Taylor, a regular in Wests Tigers starting lineups for two seasons, who has been dropped to the reserves bench. Maguire has also named Russell Packer in the starting XIII in place of Ben Matulino, who drops back to the bench. Josh Aloiai also earns promotion to the run-on side after a number of impressive performances off the bench so far this year, while young gun Thomas Mikaele returns to the bench after missing out last week. A standout in his side’s heartbreaking golden point defeat to Penrith last week, Josh Reynolds will once again partner Luke Brooks in the halves with Benji Marshall (hamstring) not available for selection. Hopefully Maguire’s tinkering produces results against the struggling Broncos on Thursday. But Wests Tigers fans will be eager to see if the team unveils a new kicker against the Broncos or stick with Ersan Marsters, pictured below. While fans love Esan Marsters the dynamic centre, they’re not so fond of his unreliable kicking, which many believe cost the Tigers the game against the Panthers. Social media was awash all week with fans calling for someone else to take over the kicking duties from Marsters. Names like Corey Thompson, Moses Mbye and Josh Reynolds have been bandied about. For my money, get Reynolds to kick – the guy is enthusiasm personified and never turns down a challenge. Apart from anything, he used to kick a bit with the Dogs. In some good news for the club, David Nofoaluma has made the squad for the first time this season, having been names in the reserves for the Broncos clash. Nofoaluma missed the start of the year with a dislocated shoulder but is available for selection this week and was named in jersey 20 as part of the 21-man squad. Wests Tigers will fly to Brisbane tomorrow ahead of Thursday’s game.